Fireflies are one of nature’s few creatures that can create their own light using an organic chemical reaction. But a group of scientists from Syracuse University may have unlocked the secret of the firefly’s bioluminescence to create a lighting system that does not require batteries or electricity. This is not the first time scientists have tried to recreate natural bioluminescence. These scientists, however, have made a breakthrough by combining nano-sized superconductors with chemical reactions to make their lighting array 20 to 30 percent more efficient than previous attempts. A firefly produces light though a chemical reaction between luciferin and enzyme luciferase. The scientists have isolated the same luciferase enzyme and attached it to nanorods made out of two superconductor metals: an outer shell of cadmium sulfide along with an inner core of cadmium seleneide. The scientists simply need to add luciferin as a fuel to create a reaction that releases energy. The nanorods absorb the energy from the reaction, which is called Bioluminescence Resonance Energy Transfer, and begin to glow. 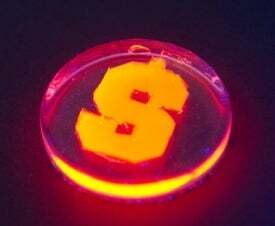 The nanorods can also be manipulated in such a way that the scientists can change the color of the lights (turning it red, orange, or green, for instance). By arranging the nanorods in a rod-in-rod architecture, the nanorods produce a near-infrared light, which could be used in night-vision goggles, telescopes, cameras, and medical imaging equipment. Currently, the team’s light-up nanorods have not made their way outside of the chemistry lab. The team is still working on improving the sustainability of the chemical reaction for longer periods of time and creating larger lighting arrays. The team’s study, “Designing Quantum Rods for Optimized Energy Transfer with Firefly Luciferase Enzymes,” is published in the journal Nano Letters.